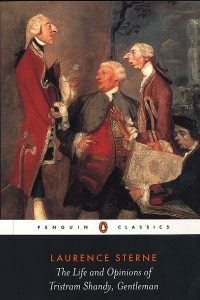 The Life and Opinions of Tristram Shandy, Gentleman is a masterpiece. Full stop. It is one of English literature’s greatest achievements, and a riotous deconstruction of the writing process in general. It relishes the subversion of expectation, pulses with comic tension, and plays its biggest (and best) jokes on the readers themselves. Now look at the date of publication. It will give you a very good idea of just how far ahead of its time this was. Sterne was breaking conventions before many authors, readers, or critics had any idea of what those conventions were. There’s one piece of advice that every young author, rightly, receives at some early point, and this novel seems like it was written as a longform monkey’s-paw response; Tristram Shandy is “write what you know” taken to its absurdist (and absurdest) conclusion. The novel itself is actually a memoir, written by the fictional Tristram Shandy. Our autobiographer takes it upon himself to set down the events of his life in text, and nine volumes of that memoir later he’s barely even started. And that’s the main joke of the experience. You sit down to read about the life and opinions of Tristram Shandy, and indeed he sat down to write them. But other things occupy his mind. Digressions give way to further digressions, which lead him naturally to speak about and explain things that had nothing to do with the story he originally meant to tell. Tristram Shandy is a constant, recursive twist through a nimble mind…the product of a fictional writer who enjoys writing so much that he cannot stop doing it, even when his pen takes him, as it so quickly does, to places he never intended to go. Tristram’s memoir, in a sense, is writing itself, with our narrator pulled along behind his own runaway tale. One gets the sense that Sterne himself was improvising as well. Not entirely, of course, and he clearly builds to certain setpieces, but one does have to wonder how many of the book’s aimless flights belong to Tristram, and how many belong to Sterne. But it’s an artful lack of focus, which is why it works so well. The Life and Opinions of Tristram Shandy, Gentleman does everything no book should ever do. It obsesses over irrelevant details. It gets lost in unnecessary explanation. It can’t decide what it wants to say…or even what it is, as Tristram’s autobiography turns into many, many, many other things, none of which, of course, are autobiographies. It does these things deliberately, however, which is what makes all the difference. We’ve all read frustratingly aimless books. Many of them are actually fairly popular, whether or not the critics understand their success. Writing is difficult, after all, and there’s always a temptation for authors to include what they believe to be some well-written passage or other, even when it doesn’t naturally fit the novel they’re writing. Tristram Shandy, then, is the phoenix that rises from the ashes of amateur mistakes…and that’s a damned big pile of ashes. The novel opens with Tristram’s conception…an event for which, of course, he was not present, but there’s no reason he can’t set it down in immaculate detail, complete with his own interpretations of his parents’ thought processes. He won’t be born for another several volumes, so in the meantime we learn about his father’s obsession with choosing for his son the perfect name (which, as this is a comedy, is not “Tristram”), his mother’s difficulties in retaining her preferred midwife, the tragedy of the family’s forgetful maid, the sickly horse of the family’s parson, the war wound his uncle Toby received at the Siege of Namur, the hobby that Toby then developed of re-enacting the battle with whatever implements were at hand, which eventually leads to the unexpected circumcision of Tristram…but, whoops, there I go, too, explaining much more than I had intended. Tristram’s problem, as you might imagine, is that if it takes him hundreds of pages to even tell the story of his first day on Earth, how will he ever cover the rest of his life? It’s a good joke, but it takes on a fairly sad real-world resonance if you know that Sterne himself was consumptive, and slowly dying as Tristram Shandy was, volume by volume, released to the world. He died the year after the last volume was published, and there have been suggestions that he intended to write more…that Tristram only stopped writing because his creator did. There’s an undercurrent of tragedy in Tristram Shandy…an assurance that no matter how much we’d like to cling something, we’re destined to be swept forward, or at least away. There’s the parallel condemnation / celebration of myopia, as Tristram finds tens of thousands of words in the smallest of observations, but loses his chance to write about so many other things as a result. There’s the reminder that however much time we spend doing something, it’s time we cannot spend doing anything else. And, of course, that it’s time we can’t get back. It’s also, however, a reminder of the enduring power of writing. Tristram and Sterne are still remembered, still read, still enjoyed centuries later. They can still speak to us. They can still share with us. They can still make us laugh, even as they remind us that the time we spend reading what they say is time spent away from our own lives. But that might be a good thing. That may in fact be the novel’s greatest gift. Life happens without structure. To seek to impose structure upon it is to invite it to fight back, to resist regimentation, to rebel against your purest intentions. That’s a struggle all writers face. Sterne embraced it, and gave the world literature’s finest self-reflexive satire. Not all of us are authors, but we each seek to impose our own structure as well. Nearly always we find, instead, chaos. Sterne would invite you to embrace that. This excellent piece is best appreciated if the sagacious reader remembers to whistle “Lilliburlero” whilst perusing. Excommunication curses optional. I’d caution against eating hot chestnuts while reading it, though. Your laughter might cause you to drop one in a sensitive area and…well…we’ve already lost one good parson that way.